Posted on May 18, 2011 at 11:19. Our customers periodically ask if it’s possible to hook a single industrial touch screen up to two computers. Using a KVM Switch, you can connect a single keyboard, mouse, and/or monitor to control multiple PC’s. There are many USB-equipped KVM Switch options on the market, but unfortunately they generally do not work with touch screens. 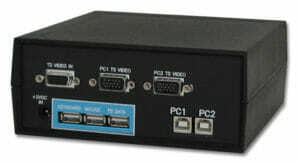 USB-equipped KVM Switches often only work with an actual USB mouse or USB keyboard. The switch understands the signals used in these devices, but signaling used in our USB touch screens is very different. To solve this problem, we found an excellent solution from Vetra Systems. 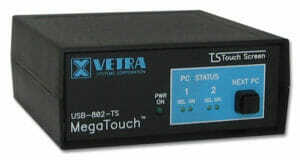 Their “MegaTouch”™ USB KVM Switch with Touchscreen Support (USB-802-KMV-TS series) works great with many USB devices and, more importantly it functions perfectly with our industrial touch screens. Installation is straightforward: first you load the touch screen drivers on each PC individually. The industrial touch screen is connected directly to each PC in turn, and calibrated. Then you simply connect the touch screen to the PC’s through the Vetra KVM Switch and the installation is complete. To select a PC, you can use a keyboard hot-key sequence or just push the button on the front panel of the KVM Switch. With Vetra’s patented TruReflekt™ technology, USB devices are recognized on both machines simultaneously but only send information to the active PC. So switching between PC’s is simple and seamless. The ability to switch from one PC to the next using the keyboard instead of the button on the front of the Vetra switch is a very important feature for the industrial user since this is not a ruggedized piece of hardware. When using one of our industrial keyboards, the non-industrial Vetra switch can be placed next to the PC’s, or in any other protected environment leaving only our industrial keyboard and touch screen exposed to the elements. We have thoroughly tested the Vetra USB-802-KMV-TS in our lab, but be sure to check out Vetra’s other products as well, because even if your setup doesn’t match the one we described here, they have products and options for many different configurations.